Now, Mike and I return to give our thoughts on ¡Tre!, the final installment in Green Day's 2012 album trilogy. Though with it being the finale, most thoughts dealt with the trilogy as a whole. 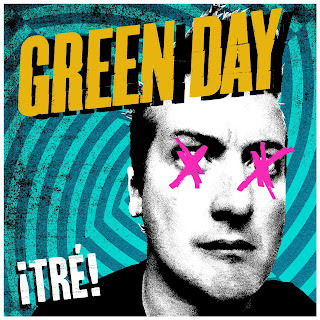 But make no mistake, ¡Tre! is an album worth looking into and we did so below. Mike: So here we are: Tre. Green Day's stadium-sized conclusion to this whole throwback inspired trilogy. Decidedly more 50s inspired, the thing that shocked me more than anything was how lean some of these songs are. Make no mistake, the album is peppered with Beatles-esque strings, porcelain piano, sassy horn sections, and even another multi-suite rock opera, but the middle is deceptively stripped down--reminding fans of Dookie, Nimrod, and Uno. Given how Tre was supposed to be the "epic" installment, a good half the album is dedicated to Green Day's 3 chord blitzkriegs. That seems to be a theme running throughout this LP: a torn sound exploring contradicting feelings. Still, it's easy to see Tre as the effervescent cousin to 21st Century Breakdown. The main difference seems to be a concerted shift away from Bush Era "the world is burning" urgency and a larger focus on "where are we now" self-refection. Even with American Idiot, it's easy to forget that Green Day never felt like an aging band. With Tre they seem older in the sense that they're finally addressing where they are in the longview. The band starts turning their thoughts inward, on where they're going and where they've been. It results in an often sobering, but upbeat, set of songs. Given this introspective slant, I was surprised that Tre comes off even looser than Dos at times. Did you get that sense? Matt: Tre comes off much looser than Dos, there is no doubt about that. I've read a lot of reports about the three albums and what they were supposed to be, but this is what I hear: Uno = the singles album, Dos = the darker look inward and Tre = the upbeat b-sides. That's not a knock on any of the albums, but they just don't seem as separated as reports have made them out to be. The Beatles-era throwback can be heard on all albums, as well as the more "punk" songs. But it does feel like Dos took you through a dim tunnel and Tre is the light at the end. Admittedly, it's hard to talk about Tre without talking about the trilogy. But I'm sure this conversation will go there so I will try to come back to just this selection. I actually waited to have this conversation because at first listen I was very underwhelmed. These weren't bad songs, but they just didn't do anything for me. A few more listens and I realized songs were becoming stuck in my head. There are some clear standouts - "Brutal Love" manages to be both soft and loud and "Amanda" is a fun sing-a-long. But what bothers me still is more than a few tracks are bland and just seem to be there. "Drama Queen" does nothing for me and "Little Boy Named Train" feels phoned in. For me personally, "Dirty Rotten Bastards" is my highlight. I was fan of the ADD-type multiple-tracks-in-one songs found on both American Idiot and 21st Century Breakdown so to see that format return here was very welcome. I think it's safe to say that you and I are having these conversations because we are fans of the band. With that said, what songs are some of your favorites? Mike: Far and away, my favorite song on Tre is "X-Kid." Between its rich harmonies and soaring chorus, I think it best captures the sense of freedom Green Day tried to explore on Tre. I definitely loved the brash, doo-wop come-on of "Brutal Love," and "Dirty Rotten Bastards" simply rips with a blistering midsection and nimble bass work from Mike Dirnt. Though the narrative is less specific than Green Day's past multi-suite songs, it's sure to be a crowd pleaser for years to come. Additionally, even though this batch of songs, wasn't overtly political, "99 Revolutions" was a lean and mean pop-punk number that embodies the spirit of what Occupy Wall Street was supposed to be, which I found immediately appealing. I agreed with you on the placid, directionless "Little Boy Named Train," but I have to disagree about "Drama Queen." For me, it was a really new perspective for Billie Joe's writing. For as far back as Dookie the "Woman-Who's-Trouble" has crept up into Green Day's stories, dragging Billie Joe through the ringer. Here, it's almost as if he sees himself in this younger person, and he's looking at her with equal parts nostalgia and wonder. It choked me up quite a bit. Between its clinking ivories and acoustic resonance, it rests comfortably in the album's 4-spot and felt like a great palate cleanser. Though Tre sports some of the slower songs in this trilogy, I can understand feeling a bit underwhelmed on first listen. Both Uno and Dos have a very strong sonic direction, and I think Tre oscillates more than Green Day meant for it to. Addressing those Beatles influences, I think that really started to creep into their writing during 21st Century Breakdown and it's not surprising that it crops up everywhere on this trilogy. In fact, it makes sense that such an aesthetic is more prevalent on Tre, given its grab bag approach to cataloging these writing sessions. I do agree that this trilogy feels separate, either in aesthetic or in content matter. Dos only really felt dark towards its close with "Amy," but I do think there is a buoyancy and clarity with the songs on Tre. In fact, I think that's why I prefer it to Dos: It operates with a level of realism and level headiness that you'd expect after 2 mammoth rock operas. Matt: I have to admit you have swayed me on “Drama Queen.” It’s still not a favorite of mine, but after looking at it from the perspective you gave it also isn’t on the list with “Little Boy Named Train.” The more I listen to Tre, the more I realize I like it more than I thought. “Walk Away” is a song I find myself wailing along with and one I might put as a closer if I were to go back and rearrange songs from each album to make one mixtape to listen to, so to speak (I am going to do that). For me though, it will still be the forgotten stepchild of the trilogy. Uno was just stronger on a song-by-song basis and Dos simply delivered. “Dark” may have been the wrong word to focus on, instead “twisted” is a better description. Even with the soulfoul bounce found at the beginning, the introduction of “Lady Cobra” into “Nightlife” helps go down the rabbit hole. Dos felt like they were throwing everything at the table and not caring if it stuck - a notion I enjoyed. But Tre, as a closing chapter, plays its part. As stated before, it’s the refreshing light at the end of the tunnel - though after three albums someone traveling through said tunnel may just be overwhelmed. It was a good idea, though maybe not executed expertly (Billie Joe’s hiatus is obviously a contributing factor). But give Green Day credit. Through the course of 37 tracks, there are some gems that were able to keep longtime fans happy and show the veteran band can still roll with the best of them.